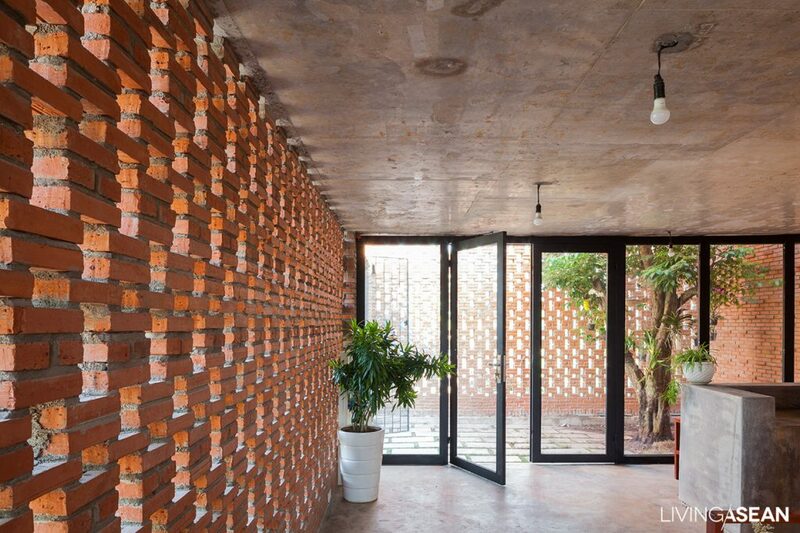 This rectangular brick home in Vietnam’s Ho Chi Minh City is designed for “hot and humid,” open to natural light and cool from air currents constantly streaming in and out through the bricks. 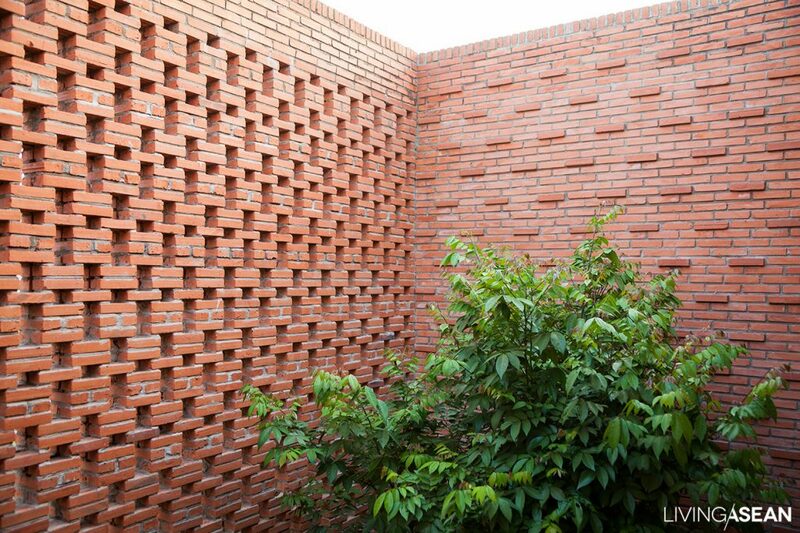 Brick doesn’t retain heat, but insulates against it, and its porosity helps retain early morning moisture which evaporates to cool at midday. Work corner next to the food preparation section is screened off for privacy. Mr. Tung Do and Mrs. Lien Dinh, the owners here, are newlyweds who wanted a small house with a straightforward design for pleasant living. 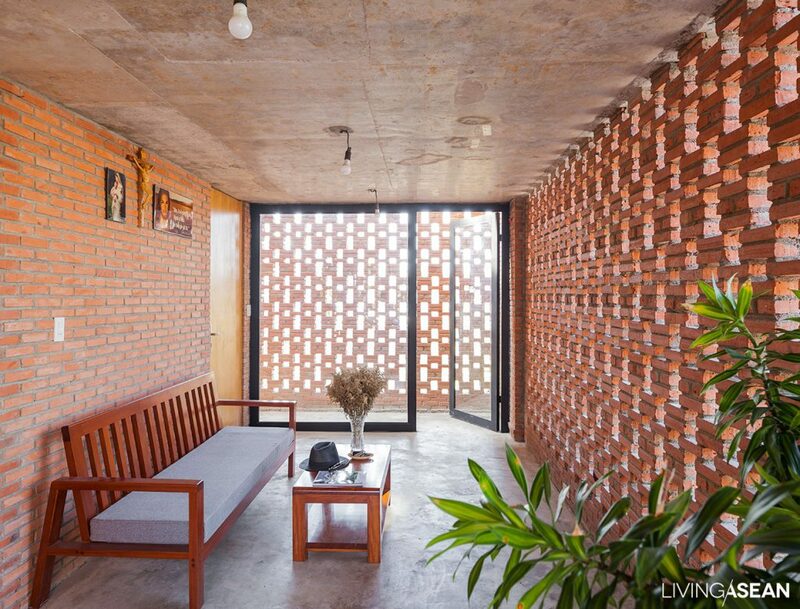 They had seen Tropical Space’s “Termitary House,” which won, among others, a 2016 Brick Award, and admired its form and design so much that – even with their limited budget – they engaged the Company to design and build their own home. 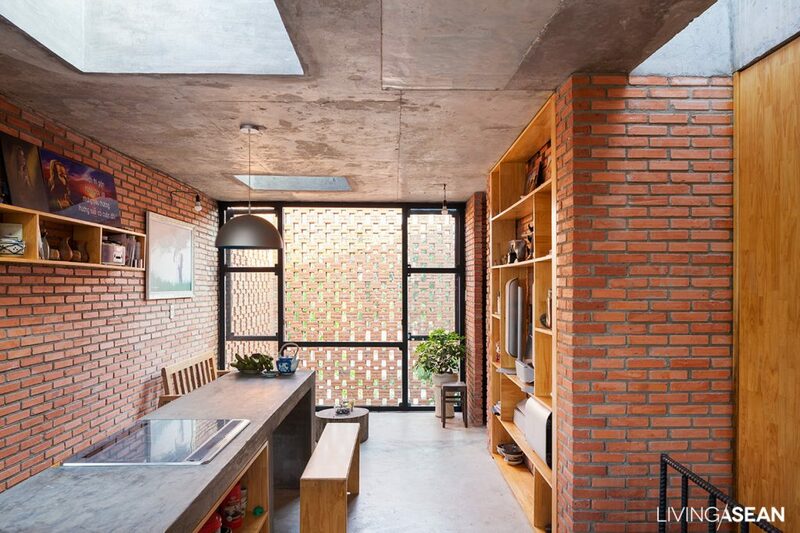 Mr. Nguyen tells us he grew up in a house of brick and never forgot his childhood vision of sunbeams flowing through open spaces between bricks to throw patterns of light and shadow on the light dust in the air, and how beautiful it was. 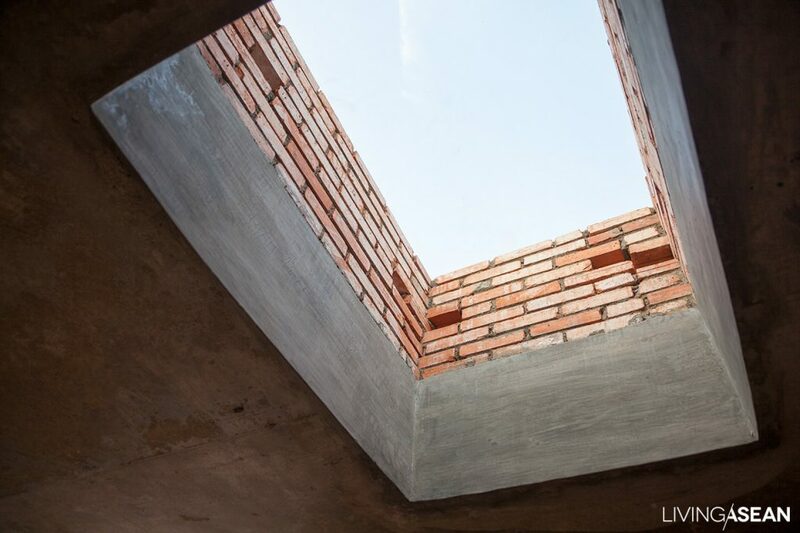 Little phenomena such as this connect people with their surroundings, and support the choice of brick as a building material. 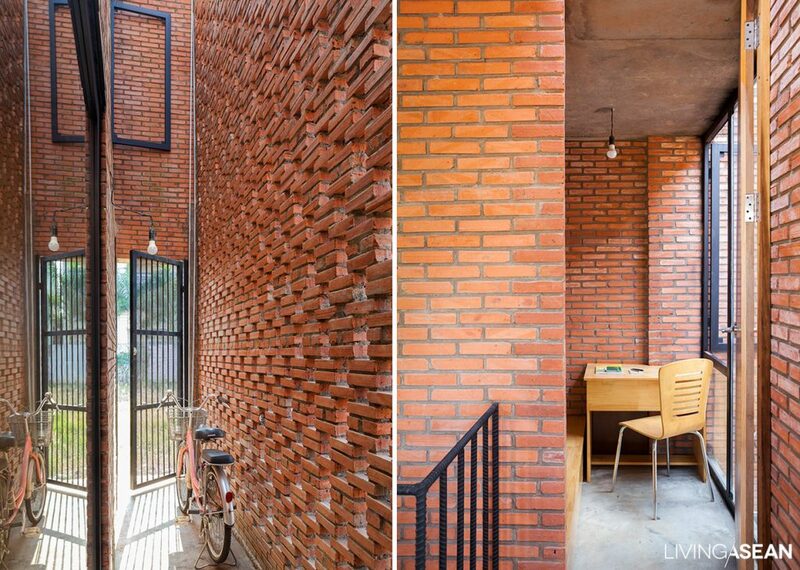 The brick wall both gives privacy and provides channels for air and light to pass through. Stair frame of rebar saves space and adds structural definition. 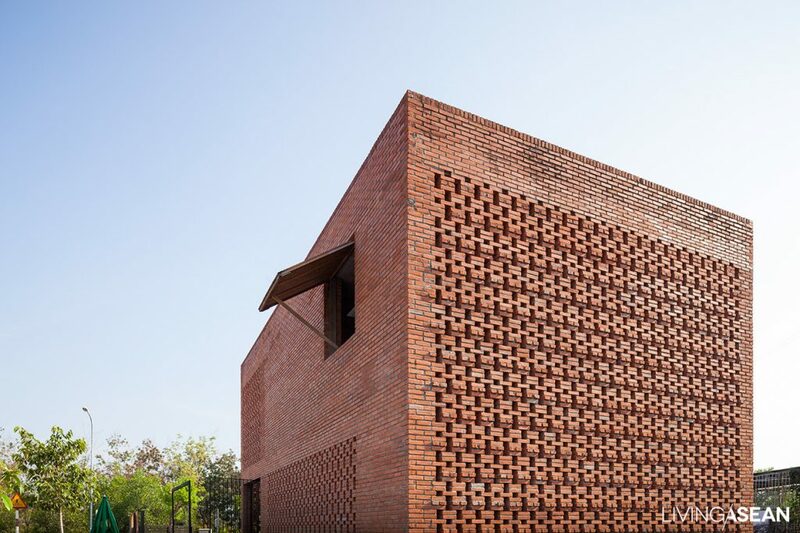 Most of Tropical Space’s design work makes use of brick, partly because the form has a certain beauty, but deeper than that, brick is an inherently Vietnamese material, indigenous to the area. The designer pays attention to its true characteristics and searches out new ways of using and arranging it, creating channels for wind and light and taking advantage of its moisture-retaining quality. 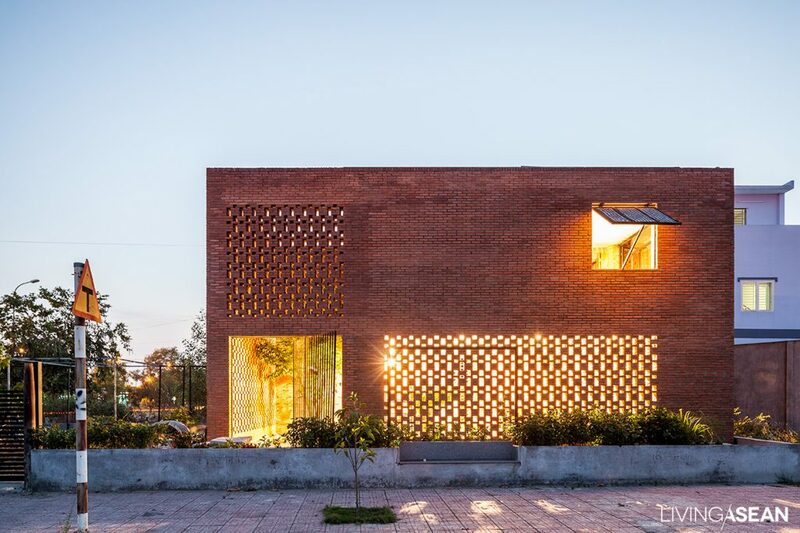 Seen from outside, the home is a rectangular block that itself resembles one humongous brick. It faces north because of sun, wind, and rain directions, and without being too hot it gets good light all day long. 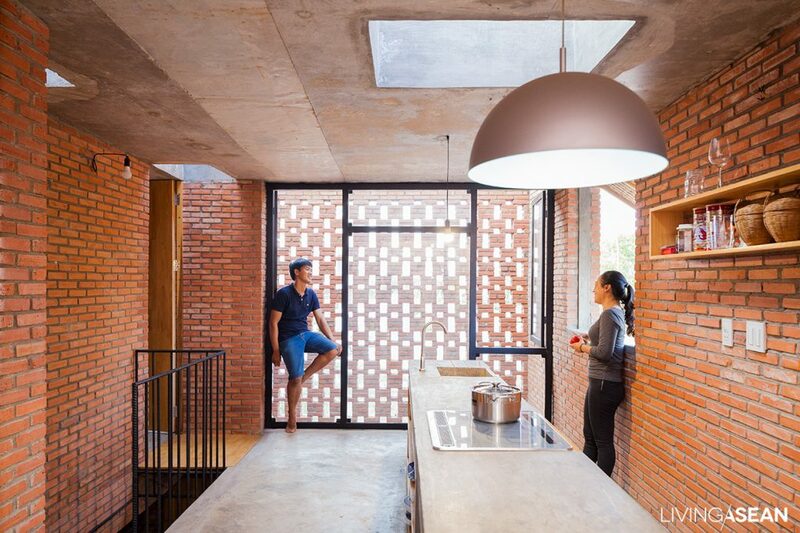 The ground floor living room features a wall of bricks alternating with open spaces, lighting and cooling at the same time during the day. 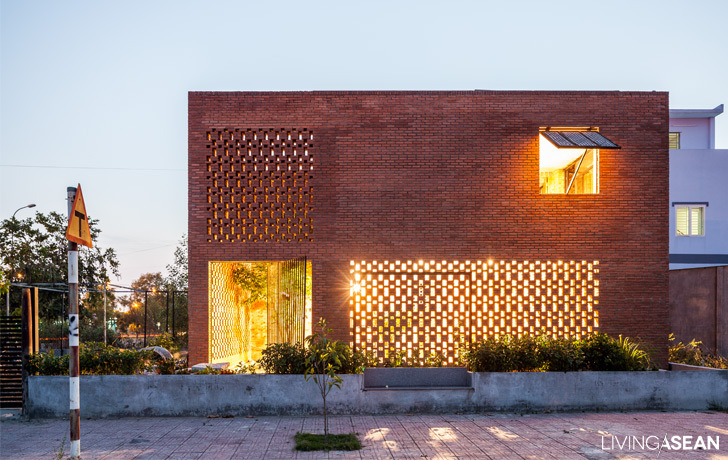 Outside, a little distance from the house to the east and west are walls that keep sunlight from directly hitting it, instead reflecting light through the perforated brick wall and into every inside area. 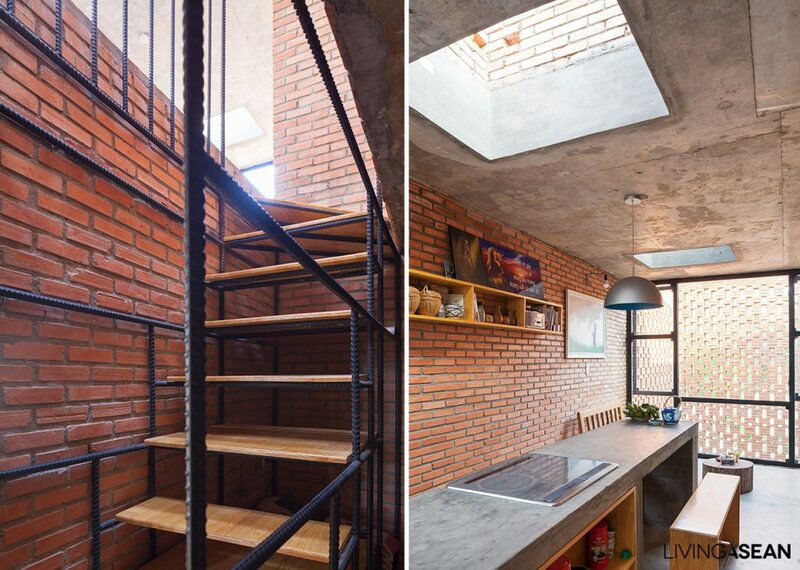 These outside walls also create channels that guide the wind in and out. Trees are planted there, too, which cool the house with their shade. The house may look a bit severe, but in this tropical climate its architecture aligns beautifully with nature to provide an amazingly comfortable residence built on a moderate budget. Openings above and on the sides for natural light to enter during the day.